Get a custom hand-drawn caricature of a person with car created by professional Photolamus artist. Colored pencils caricature will be created once on special A4 or A3 Paper, strictly based on submitted photos and described ideas. Caricature of any car enthusiast will make a wonderful and personalized gift for the recipient on Birthday, Christmas, Valentine's Day or any other occasion. If you wish, we can draw specific elements according to matter of this caricature gift. For example, red hearts, snowflakes or balloons. We will create your caricature drawing quickly and professionally. We aim to make customer satisfied and we respect all of your ideas and wishes. Mention your requirements below and attach high quality photographs. Caricature will be delivered as a ready-to be-printed JPG File on Email. 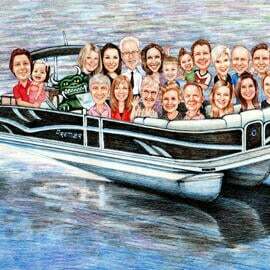 Additional delivery options: Caricature printed on Canvas, Caricature printed on Photo Paper or Original Caricature Drawing. For your comfort, we provide worldwide shipping for any ordered caricature drawing.